Tomorrow we celebrate Valentine’s Day and this year, for the first time in so many years, it truly means something special for me. A love like no other is in my heart and the smile it brings to my entire being is one that lights my world. Nancy, my love, you are the one who brings sweetness and joy into my life, you have brought me so much more this year and I know that will continue for so many years to come. Your smile and touch cause all my worries to disappear. You are bringing a faith back into my life. I have always had a core belief, but you are showing me the path back to a complete embrace of our Lord. So far this year we have worked through some difficult situations in our lives, but we have also been blessed by wonderful news. I feel deeply that tomorrow, we shall be blessed once again. This year will bring us our first vacation together, a chance to be alone on a warm sunny beach, allowing the ocean and salt air to wash over us and bring us a renewed spirit. Later this year we will stand in front of friends, family and the Lord and we will join together in marriage…allowing our two distinct personalities and beings to form an unbeatable team of two. You have shown me that the Vinny that has been put in a box for so long can, once again, flourish in its whole and for that I am forever grateful. I see the sparkle in your eyes when we are together and there is no greater gift than that…seeing your love for me and knowing you feel the incredible love I have for you. Each morning your text message to me as I wake begins my day with a smile. A simple text of kiss during the day brings warmth that washes over me. Thank you my love for such a special Valentine’s gift. Your words warm my heart and touch my soul. We've truly been blessed in so many ways. PHFRANKIE: Actually, I think it is even better to be me. Oh geez, just when I feel my most cynical about love and Valentine's day, you post this. I feel my heart starting to thaw. SONGBIRD: Thank you my dear friend...I did not think it would be possible..but it happened! I am glad you like the ring...smile! I am a late learner of the news but I know that Nancy has sought after the Lord in all decisions in her life for many years now. I am SO EXCITED for the two of you and that God is allowing you to see the rewards He has in store! 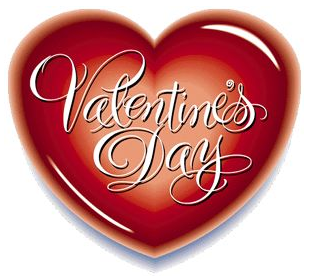 Many many blessings - Lynda C.
BECKEYE: Thanks and neither of us waits for a special day...but do celebrate this day...and Hallmark makes very little money off of me! MARY: As i said above...I am the lucky one...and a Happy Valentine's Day to you and your Vinny! A wonderful post. You are both so lucky to have found each other. May you have many many years together in the future. 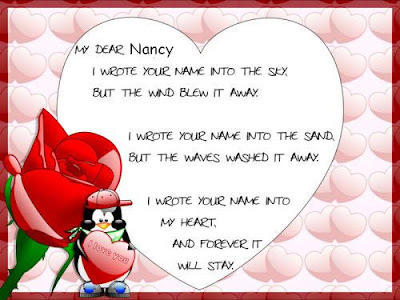 Happy Valentines to you and Nancy! Ah yes, the softer side of Vinny. Glad Nancy has brought so much joy back into your life! To be honest - I skimmed the top coz it's for Nancy really isn't it?! I'm happy you're happy! Now the ring - WOW. It's beautiful. It's simple but not plain... gorgeous. I saw my dad fall head over heels in love in his late fifties, it was beautiful! Happy Valentine's Day to Nancy and you, Vinny! OOoooh! You're getting now Vinny! YAY!!! I go "awwwww" when I think of the odds here. Happy Valentine's Day to both of you! Aww, what a sweet post, Vinny. I know you two had a wonderful Valentine's Day yesterday. The diamond ring is stunning! Good job, old chap. (Kimmie grabs tissue box)...you gave me the misties! Your love for each other has given me hope. Bless you for that. That's a beautiful post. I'm so very happy for you two!